EV Road Test: Volkswagen e-Golf intro – HubNut – celebrating the average! Ok, a break from the shambolic cavalcade of shabby old cars, as I conduct one of my Electric Vehicle Road Tests. The Volkswagen e-Golf has arrived. It has 104-miles of range showing and we’re about to head out to start the tests proper. Naturally, I haven’t read the manual, understand that the range is going to drop quite rapidly as soon as I encounter a hill (about quarter of a mile to the first one) and only have a vague idea of where suitable chargers are. 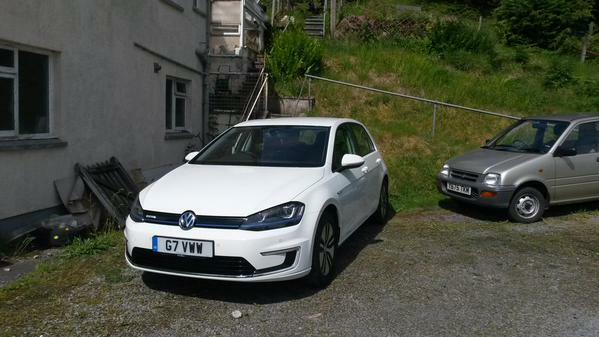 The e-Golf has landed. Let the test commence! Let’s be honest. The terrain here in beautiful mid Wales is not ideal for electric cars. That said, the number of long descents allows for a good amount of regeneration – putting charge back into the batteries rather than using the brakes to slow the vehicle. So, it’ll lose a fair bit going up, but will get some back coming down. Over the next week, I aim to get a realistic feel for the range of this vehicle well away from city limits. Stay tuned for more as it happens. I’ll be live-tweeting my experiences.